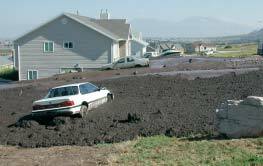 Sediment deposited at the intersection of Lambert Avenue and Apple View Street in Santaquin. 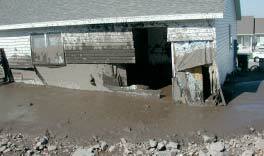 The debris flow moved cars and filled basements with sediment. On the evening of September 12, 2002, intense thunderstorm rainfall on Dry Mountain, about 18 miles south of Provo, triggered fire-related debris flows that traveled down drainages and onto alluvial fans, damaging houses and property in Spring Lake and Santaquin east of Interstate 15. Fire-related debris flows are debris flows that start in areas burned by wildfires. Wildfires can produce conditions favorable for debris flows because they expose bare soil to erosion by burning vegetation and creating water-repellent soil conditions that promote rapid runoff. The September 12, 2002, fire-related debris flows started high in the drainages of Dry Mountain that burned in the 2001 Mollie wildfire, a human-caused fire that burned 8,000 acres between August 18 and September 1, 2001. The storm was relatively short in duration, only dropping 0.27 inches of rain. However, it was preceeded by several days of light rain that kept soils wet and promoted runoff, triggering multiple debris flows on the west flank of Dry Mountain. Three debris flows deposited sediment in subdivisions built on alluvial fans in Spring Lake and Santaquin, and others deposited sediment in undeveloped areas. The debris flows were typical of other historical debris flows in Utah, occurring with little warning and traveling quickly down the channels and onto alluvial fans. Homeowners had little time to react. One flow in Spring Lake filled part of the High Line irrigation canal with sediment, causing flooding in addition to debris-flow damage. 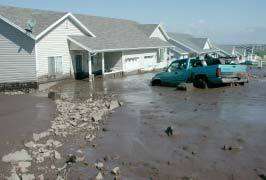 The most damaging debris flow traveled through a subdivision in Santaquin that was evacuated immediately after the event. This debris flow moved and partially buried several vehicles, broke through a house wall, and entered other houses through broken basement windows and doors. Debris-flow impacts also tore gas meters from their mounts, causing gas leaks and a small fire. The majority of house damage was due to sediment and water flowing into houses. Sediment flow and burial on lots also damaged landscaping and property outside the houses. The flow did not follow city streets, but rather flowed around houses and through lots. Following the Mollie fire in September 2001, an assessment of post-burn conditions on Dry Mountain by state and federal agencies, including the Utah Geological Survey, identified an increased debris-flow and flood hazard to the subdivisions on the alluvial fans. These agencies recommended that local communities perform a more detailed hazard evaluation to determine where emergency measures were necessary. These agencies also noted that debris-flow and flooding hazards existed in these areas before the fire, and that efforts to address the short-term hazards related to the fire should also consider the long-term potential of debris flows and floods. 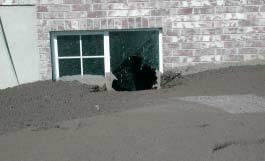 The homes and subdivisions apparently were constructed without regard to the debris-flow hazard. Because no emergency measures were taken to divert or contain flows to protect houses and property in response to recommendations in 2001, both short- and long-term debris-flow hazards remain. Local communities are now planning to take active defensive measures.